Study finds poorer families pay higher local state tax rate. A man holds a sign advertising a tax preparation office. As we enter tax season—hurray!—here’s something that might surprise you when you pay your local and state taxes: The less you earn, the greater the share of your income you’re paying in taxes. 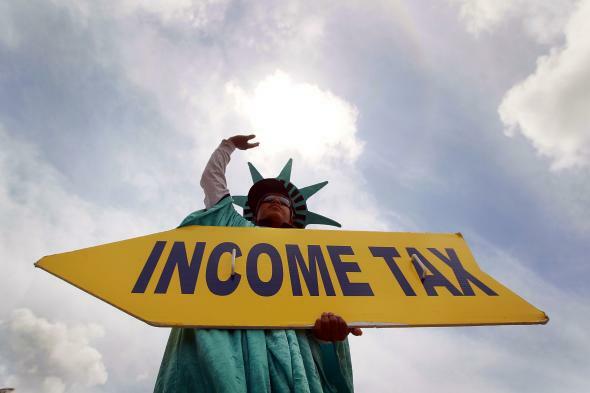 That’s according to a recent study by the Institute on Taxation and Economic Policy that set out to assess the fairness of the tax code in each state. Virtually every state tax system is fundamentally unfair, taking a much greater share of income from low- and middle-income families than from wealthy families. The absence of a graduated personal income tax and overreliance on consumption taxes exacerbate this problem. The lower one’s income, the higher one’s overall effective state and local tax rate. Combining all state and local income, property, sales and excise taxes that Americans pay, the nationwide average effective state and local tax rates by income group are 10.9 percent for the poorest 20 percent of individuals and families, 9.4 percent for the middle 20 percent and 5.4 percent for the top 1 percent.